First, thanks to Dai and the team at YSJ for setting it up. Bravo! Second, I was struck by something that a couple of people said. First off Clark Denmark and then Nicola Nunn about my choice of speech over sign for my presentation. Before the conference, I had contacted Dai to find out whether it would be better to sign or speak – Dai knows me well, and knows my signing. The recommendation was to use which ever medium would allow most accurate communication, and (if that were speech) then to let the communication professionals there do the job of interpreting it into BSL. So I chose to speak. It turned out to be an interesting experiment. The interpreters did a great job, and interpreted accurately… but (perhaps, particularly after Graham had signed) there was a palpable disengagement from the Deaf members of the audience when I started to speak. Nicola’s point, later, was that although interpretation provided clear and accurate information, it didn’t allow me… as in *me* to engage with the audience. It was hard to engage through the proxy of another person. Particularly when when I was saying was very personal. Dai’s not to blame… there’s no ‘blame’… Simply, there seems to be a qualitative difference between the impact that the communicative medium has for an audience – particularly a Deaf audience. Communicative ‘accuracy’ (in terms of fewer mistakes) is less persuasive–ultimately, less communicative?–than adopting the Deaf community’s *own* language even if my mangling of it is quite imperfect. So, an interesting question to ponder as we’re talking about academic and community engagement, is the role of language. Communicative perfection, or direct personal engagement? 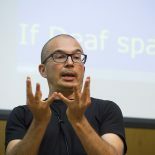 I’ve had some experience of this recently; I normally present in Irish Sign Language when I present about my research, but I had a couple of sessions presenting in Northern Ireland to (ostensibly) BSL-using Deaf audiences. The first time I used a BSL interpreter, and I felt some of the same sort of disengagement that you describe; the second time I tried presenting in BSL, which I am not that fluent in, asking the audience to bear with me – and it went swimmingly That said, I had a very visually engaging PowerPoint that was always a resource to use in case of communication breakdown. There’s obviously a limit to how far you could take that, and I’m mindful of your recent post on ‘bad quality signing’ in this respect. Nevertheless when it comes to our ‘first’ signed languages, I think the impact made is much stronger if we present in those languages, even where we may not be native signers. It’s that question of ‘limit’ that is interesting. I think we assume, as academics, that the total integrity of our message relies on 100% accuracy. But should I not be able to present something complex on spatial theory in BSL, as well as I can talk about the history of the Deaf church, for example. In some ways, what forces the limit to be there is how formal we make our presentations. If I’m just going to stand there and talk, then I need to be competent to do that without faltering. So there’s a limit on what I can do. If, on the other hand, my presentation is much more involved, more flexible, more linguistically adventurous, more engaging anyway(! ), then I’ll have the space there to gradually build ideas, negotiate meaning, and so on. That allows me to work in BSL much more. Oh, and by the way, I think the ‘bad signing’ thing only applies to situations where the ‘real’ audience for the signing is actually the hearing world… so I don’t think you need to worry about that here. This entry was posted on November 24, 2014 by Mike Gulliver in Musings.